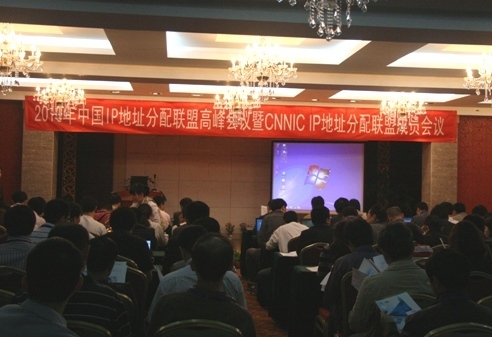 From May 19 to May 21 in 2010, CNNIC convoked the "2010 Summit of China IP Address Allocation Alliance & CNNIC IP Address Allocation Alliance Membership Conference". Relevant officials and officers from the Ministry of Industry and Information Technology, five infrastructure network operators, Internet service providers (ICP/ISP/IDC), equipment suppliers, and renowned enterprises such as Cisco attended this summit to discuss hot topics of Internet closely related to IP technology including the Internet of Things, Tri-networks integration, and promotion of IPv6 , etc. Lin Shaofu, Director of the Department of Science, Technology and Standards of Beijing Municipal Commission of Economy and Information Technology, and Mao Weidong, Director from CNNIC respectively delivered a theme speech. Lin Shaofu briefed on the status quo of the Internet of Things whose development, in his opinion, will generate great demands for IP addresses. Director Mao Weidong remarked that confronted with the upcoming exhaustion of IPv4 addresses, we must attach importance to the reasonable planning and application of IPv4 addresses, and get ready for the transition to IPv6 from IPv4. CNNIC elaborated at the meeting the latest allocation policy and trends of international IP addresses, the progress made by CNNIC IP Address Allocation Alliance, deployment and address planning of IPv6, DNS security and challenges, etc. Moreover, the participants of the summit conducted extensive in-depth discussions on the latest development of the Internet of Things, Tri-networks integration policies both at home and abroad and promotion of IPv6 deployment. The annual Summit of China IP Address Allocation Alliance provides domestic Internet enterprises with a high-level platform for information exchange which enables domestic Internet organizations to understand more and get more familiar with the formulation of international IP address allocation policies, touch on the pulse of the international IP address policy, and master the latest trend of global IP address technology. Meanwhile, it also intensifies the cooperation and reciprocity among enterprises, and thus provides incentives to the further development of Internet in China.